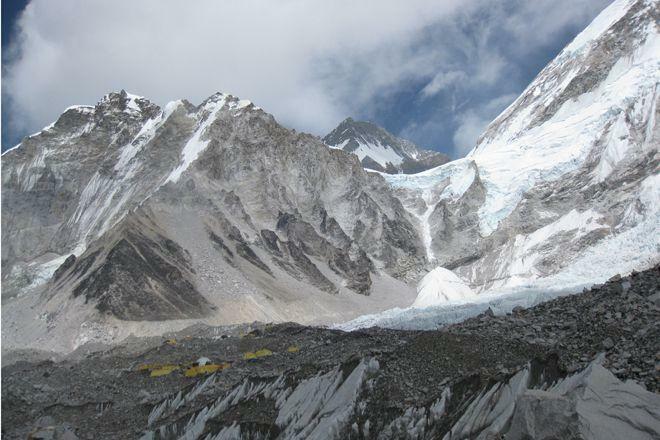 Everest Base Camp: Trek Target… or Marathon Starting Line? Just a few weeks ago, as seasoned climbers and first-timers alike were completing their successful attempts at an Everest Base Camp trek, another group of adventurous spirits were going in the opposite direction – running the world’s highest marathon. They were competing in the tenth annual Tenzing-Hillary Everest Marathon, held to mark the anniversary of Tenzing and Hillary’s famous conquest of Everest’s summit on May 29, 1953. Chilly conditions for an Everest Base Camp trek – or a marathon! The 42-kilometre race trail began at 7:00 am in Gorak Shep, and finished at Namche Bazaar, crossing narrow rocky passes and suspension bridges, passing through Buddhist monasteries and monuments – all at breath-shortening altitudes and near-freezing temperatures. Now in its tenth year, the marathon is attracting more participants than ever – 62 Nepali and 93 foreign runners took part this year, a far cry from the handful of competitors who ran in the inaugural race. Competitors included runners from as far and wide as the UK, New Zealand and Hong Kong. Phurba Tamang, a Nepalese runner, won the marathon, completing it in 3 hours, 41 minutes and 31 seconds – not quite beating his own winning time of two years ago. A Tara Air employee, he had only a week of leave in which to train in Lukla, but spoke afterwards about how determined he was to win this year, after having to drop out halfway through last year’s marathon. Second and third places went to Kumar Rajbhandari and last year’s winner Sudip Kulung Rai, respectively. Tamang has said that he hopes to set a new record by competing next year and winning the race for the fourth time. With next year’s race a while off yet, there’s plenty of time for other hopeful contenders to train themselves up. So… anyone out there thinking of adding this to their list after completing an Everest Base Camp trek?